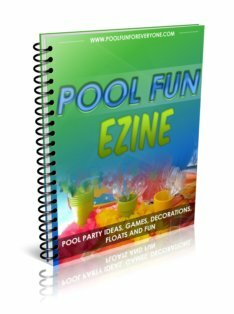 Frozen alcohol drinks served with a fresh slice of fruit add to the festive atmosphere of an adult pool party. 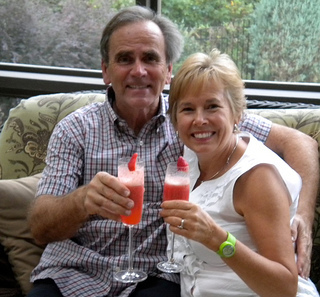 Strawberry Surprise Champagne or Watermelon Delight are just two of my refreshing favorites. Be sure to use only high quality acrylic wine glasses . There should be no glass to shatter out by the pool. Fill blender halfway with ice cubes. Add rum, coconut cream, coconut milk and pineapple chunks. Puree. Garnish with a slice of pineapple and maraschino cherry. OK, now for the recipe. It is so simple but refreshing. 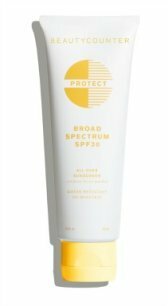 It is adapted from Eat Yourself Skinny blogspot. (optional to add some fresh mint leaves) My husband doesn't like mint so we left it out. Mix in a blender. Fill each champagne glass about 1/3 - 1/2 with strawberry puree and the rest with champagne. Tilt the glass to help reduce the foaming. Or let it rest for a minute and add more champagne. 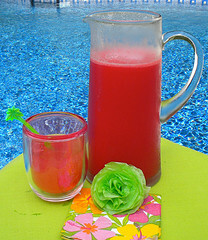 My sister served this great watermelon drink and we loved the refreshing taste. In a container mix the watermelon, strawberries, sugar and lemon juice. You can do this ahead of time. When it's time to serve just put the mix in the blender and add 2 Cups of ice cubes. It is really good! 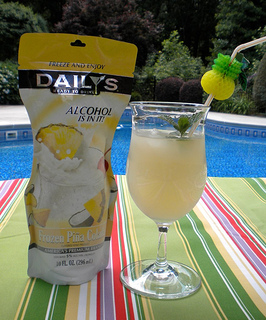 You can make your own drink or we have found these easy to serve drinks in a bag at our local grocery store. They come in several flavors like Pina Colada and Strawberry Daiquiri. You can serve them as is with a straw - but it is much more party like to put them in nice polycarbonate wine glasses with a festive straw. Keep a bunch of them in your freezer so you are ready for any last minute entertaining. 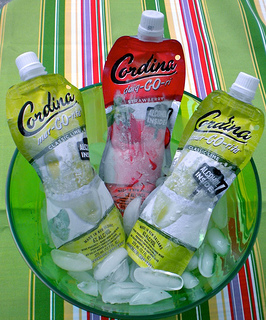 Frozen mixed drinks make it even easier to be ready any time for a party. 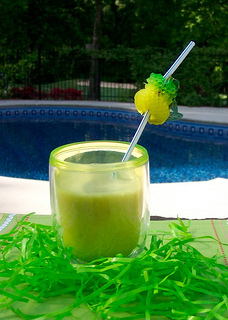 For example pina colada, strawberry daiquri or a refreshing margarita can all be bought in these neat single servings. Freeze them and serve as is with a straw or thaw them just a little and pour into acrylic wine glasses. I like to add a little ginger ale or Sprite to mine and serve it with a fun straw. 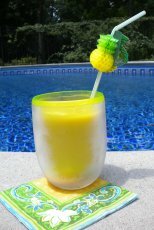 This frozen drink recipe can be made with or without alcohol. Bring water and sugar to a boil in a 2 quart saucepan. Boil uncovered for 5 minutes or until sugar is dissolved, stirring occasionally. Remove from heat. Stir in lemon juice, lemon liqueur, and lemon zest. Pour into 13 x 9 inch pan. Freeze for 1 hour. Stir and then cover the pan. Freeze at least 2 hours or overnight. Serve by scraping and scooping the lemon ice into serving dishes and top with mint. Blend ingredients until ice is slushy. Pour into frosted glasses and enjoy.